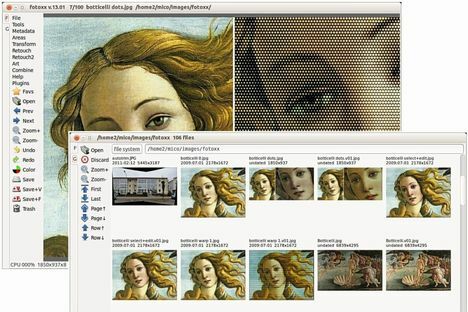 Mashup images and text can be moved, resized and rotated using the mouse. Trim/Crop and Rotate were combined as one function to improve workflow. Rotate: click image position to add vertical and horizontal guidelines. Rotate: the automatic trim option was reinstated. Flatten and Expand brightness distribution were combined as one function. Paint/Clone: new option to paint/erase gradually or fully in one stroke. Gallery thumbnail popup menu: rotate +/-90 degrees was added. Gallery [Top] button: new option to choose from named collections. World map zoom: toggle full-size/fit-window without intermediate steps. Slide Show: allow pause and resume at a selected image position. Slide Show: an image with the tag ‘pause’ will beep and pause until resumed. View Metadata: option to show only captions and comments (e.g. for slide show). Making a named collection from search results (or any gallery) was simplified. CMYK function: the user interface was simplified. Warp Linear/Curved/Affine are using multiple threads for faster response. Bugfix: clickable tabular reports would not scroll with the mouse wheel. Bugfix: the interactive translation update function was broken. Download Fotoxx at its official website. Before get started installing the package, you need to first install dcraw & ufraw in Ubuntu Software Center.